Apple to make future iPhones compatible with a cutting-edge technology that has the capability to transmit data at 100 times the speed of WiFi, suggests the code found within the iOS firmware. Apple may ship future iPhones with Li-Fi capabilities, a new technology that may end up replacing the widely-used Wi-Fi in the future technology. Beginning with iOS 9.1 update, the operating system's source code makes mention of "LiFiCapability" alongside declarations to other hardware and software capabilities, hinting that Apple may be experimenting with ways to integrate Li-Fi technology with future iPhones models. Li-Fi compatibility was spotted in the code for iOS 9.1 by a Twitter user, who goes by name Chase Fromm, and was independently confirmed by Apple Insider. However, there is no such indication that Apple is actually working with Li-Fi. But, as pointed out by Apple Insider, Apple filed a patent application for a device in 2013 that described a method of "optical modulation using an image sensor," hinting that the company may have been working on new ways to utilize light to transmit data. Li-Fi, a next-generation technology invented by Professor Harald Hass of the University of Edinburgh in 2011, is capable of transmitting data via light (i.e. Visible Light Communication or VLC). 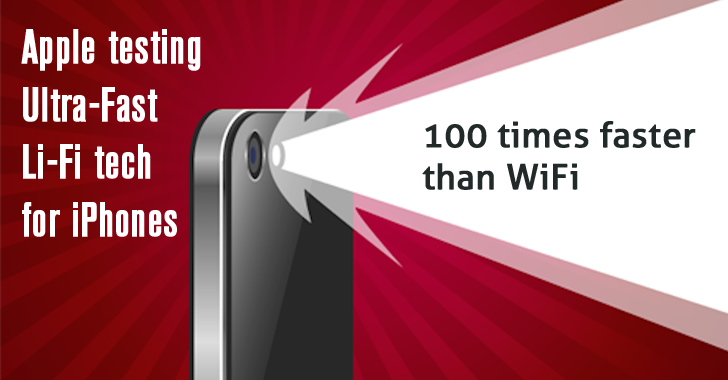 The thing that makes Li-Fi so compelling is its fastest data transferring speed. Li-Fi tests have shown it can transmit information more than 100 times faster than a standard Wi-Fi network, with theoretical speeds of around 224 gigabits per second. This means that you could download multiple high-definition (HD) movies to your iPhone over a LiFi connection in a matter of seconds. However, it is unclear how Apple intends to make use of LiFi, as, at the present, no technology on the market uses LiFi. So, it could be used for talking to devices, say the Apple TV, within the same room. This is just speculation. So, is Li-Fi technology likely to be a feature with iPhone 7? Given the early stages of the LiFi technology, it is unlikely to say that it could be a feature with iPhone 7. Although a number of companies are working to commercialize the technology, it is expected that Li-Fi could be ready for commercial use by the end of the decade. Also, despite promising high speed, LiFi has some limitations. The biggest drawback to the LiFi technology is that it cannot work through walls because visible light cannot penetrate through walls. Besides this, the LiFi technology also requires a direct line of sight between the transmitter and the device in order to operate. However, this limitation could be seen as a boon as it make Li-Fi secure from external sniffing. Meanwhile, this also means there is less interference from other devices, making the technology a more secure transfer protocol than standard Wi-Fi.